Jim Brown, pastor of Grace Community Church, a Grace Brethren church in Goshen, Ind. and past moderator of the Fellowship of Grace Brethren Churches, is on the cover of the Elkhart County (Ind.) 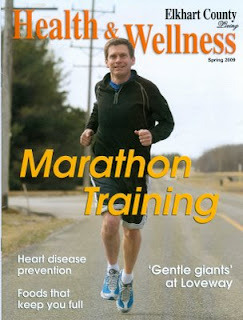 Health and Wellness magazine. He writes about it on his blog, the Brown Bytes. Recently I was contacted by a local reporter, asking me questions about exercise. This writer was the editor of a Health and Wellness Magazine. She wanted to write an article about marathon training. So they wrote an article about my personal plan for the marathon, I will be running in May. This came out of left field, and I had no idea I would appear on the front cover. For reasons beyond me, God must have a greater purpose for this. My hope is that this will elevate the need for us, to take care of our bodies. We house the Holy Spirit, and I want to give him the best house possible, to live in. I also hope that it points people to Jesus, and encourages people to start a health plan, so that they do not limit themselves in accomplishing God’s plan for them, because of poor health choices. I also hope it encourages dads and husbands to develop a good quality of life, so that they can offer their wives the best quality of life in their empty nest days. I also hope it encourages them to stay healthy, so that they can play ball and run with their kids as they age too. Please God use this article to do that and more!